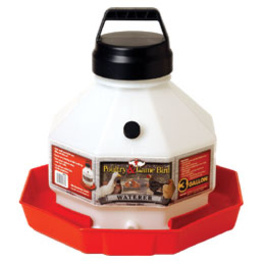 We recently bought a Little Giant 3 Gallon Plastic Poultry Waterer for our ducks and chickens. It looked like it would be a great waterer for the ducks. It has a deep bottom dish which is great for the ducks to dip and clean their bills in. When I got it home and filled it up, the water just keep pouring out of the bottom hole and overflowing. I couldn’t figure out what I was doing wrong. The instructions on the outside basically state to unscrew the small black cap and place it on the bottom opening to plug the water flow. Then you unscrew the top cap/handle and fill with water. It says to be sure not to over tighten the cap. So I followed the directions, set it up, unscrewed the small black cap and the water just started pouring out, filled the bottom dish and poured over. It drained almost all 3 gallons. I thought it might be that it needed to be more level, but leveling it out didn’t help. I finally found the fix to the problem explained on the underside of the top screw on cap/handle. There are a few instructions on the underside of the cap explaining how to create a vacuum in the container, allowing the water to slowly come out as the water level in the drinking dish goes down. First you should apply cooking oil or Vaseline to the o-ring on the lid section. This helps seal holes around the o-ring, preventing air escaping and not creating a vacuum within the container. Also before taking off the small black cap that keeps the water from pouring out, you should tighten (but not over tighten) the top cap/handle and then rotate it back a 1/2 turn until the black handle is aligned or parallel with the small opening were the water pours out. Now the little giant waterer works perfectly and I’m now only cleaning and filling the waterer every other day instead of 2 times a day.